Time for week 44 in the series 'Our PDA Story'. This series has been running since 2015 and the original idea behind it was to showcase experiences of other families living with Pathological Demand Avoidance. 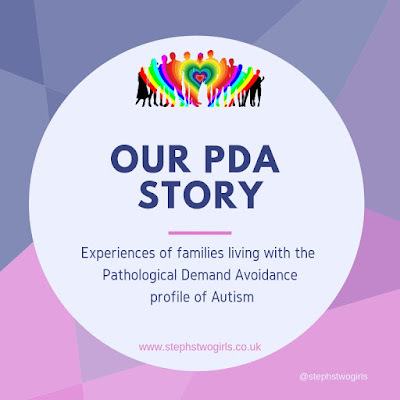 The aim is to help others understand the challenges that are faced by those with PDA and their families, at the same time as hopefully helping families to not feel so alone. The writer this week is staying anonymous; when you get to the bottom of the post you will understand why. Many examples of the struggles which can be faced by a person with PDA are given below. Some of them may seem like a child is 'just' being disobedient, or awkward, or lazy, but when you put them all together and experience all of these, it's easier to see that it's more than that. When she wakes herself up at 5am to leave at 7.30 and still hasn't left at 9. When she stands in the kitchen, feet refusing to move, becoming late when she was on time. When you get a text every day saying the same thing "detention after school for missing class". When she is 5 minutes late but then decides not to leave for an hour because she is worried about being late. When she goes to the toilet in English and doesn't return to class. When she is dropped at school at 8 yet still manages to be late for the first lesson. When, instead of being in bed she is stood in the middle of her room. Just standing. When it's 2am and all of a sudden 5 million very important things need to be said before she can go to bed. When it's 11pm and she is ready for bed, in her pyjamas but just needs a shower and then screams her head off in the shower because she wants to be in bed! When she gets into bed but then deliberately causes her brother to have a meltdown so she can't sleep. When she slams the door into the wall you just mended because you told her she needs to be careful opening it. When you tell her to take her wet shoes off to walk on the carpet and after 10 minutes of standing by the door she manages to take one off and hop. When you need to go out but know you have to tell her you are leaving an hour earlier. When you clear up her plate, still full of food and she cries 5 minutes later because she is hungry. When you take her to dance class and she sits under the table. When she dresses as a pumpkin because she wanted to and cries because she isn't a witch. When she spends 3 hours getting ready and dressed up then washes it all off at the last minute. When she wants to join in with her friends but sits on her own nearby. When you spend 2 hours trying to get her to take medicine she needs and end up forking out £20 for her to take it. When she just cant go somewhere you know she really wants to. When she is at a dance competition and stops dancing half way through. When she stops and stares and can't do what she is meant to do. When homework isn't done and she is super stressed because she hasn't done it. When she moves up a set in science to the class she wants to be in and never does another lesson. When she gets in trouble because her school uniform is in her bag and she is wearing her own T-shirt. When she refuses to move out of her aisle seat on a plane even though the person next to her is desperate for the toilet. When she won't clean her teeth at bedtime unless you pass her the toothbrush. When you have been struck off from the dentist due to too many missed appointments. When you have to ban the internet and social media because she knows why but just can't follow safety rules. When you know she is kind, helpful, lovely, funny, beautiful inside and out but she won't help when you ask. When she walks to a different bus stop because she didn't want to get that bus. When she wants her hair blonde but dyes it pink then hates it. When she asks for toast then goes mad because you make her some. When she wants a hug but wont let you near. When she leaves for school on time but waits for 2 buses to pass without getting on them and ends up late. When everything takes longer than it should. You often don't end up where you should be and you haven't slept properly in years. When you celebrate that your child is late for school because it means they made it to school that day. When she loves swimming but sits on the edge. When she won't talk to the psychologist or comply with the assessment and therefore has no diagnosis. When she has her period but won't deal with it. When you have to avoid most normal ways of parenting, turn everything on its head and let her feel like she is in control without that control feeling like a demand. When you can't put this post on your own blog because she doesn't want the world knowing she struggles.